I’m just going to put this out there first; I’m not really a big fan of roguelike games. Those types of games where you seem to run around aimlessly for hours on end just didn’t appeal to me — that is, until now. Cardinal Quest is one of those games that I could play forever and never regret a single minute of it. There are many, many reasons as to why this is one of my favorite games of all time, and I’m guessing that you want me to tell you, right? No? Well, then I’ll just do it anyway. You play through Cardinal Quest to get through every floor until you get to the horde of minotaurs on the last floor. Your job then is simple: kill. When you start the game, you start out as one of three characters; a Thief, a Wizard or a Fighter. Each of these classes has special stats and abilities that make them unique. If you are a beginner, then the Fighter is highly recommended, even by the game itself. This is because the Fighter is the more balanced of the three. The Thief is the quickest, but it’s also the most challenging, and relies on its skills. Then, there’s the wizard who can cast spells rapidly. Personally, I prefer using the Wizard because of his spells and agility, but that’s just me. 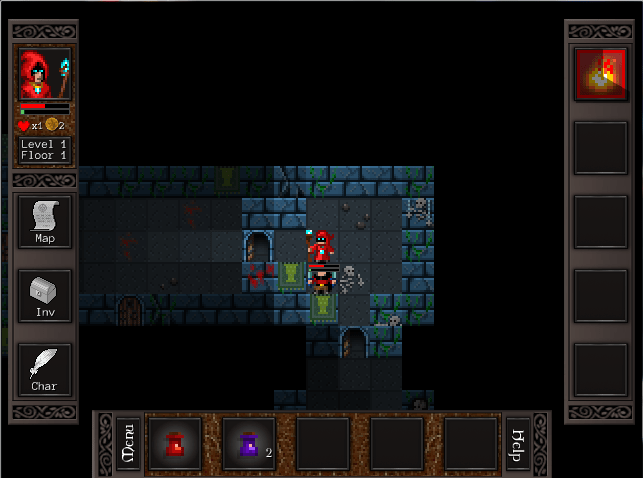 As I previously stated, this game is a roguelike dungeon crawler, and it executes this perfectly. The game runs smoothly and doesn’t appear to have any noticeable bugs associated with it. You can either control the game via the keyboard, or the mouse. As usual with PC games, you use WASD to move the numbers on your keyboard for your potions and spells (1-5 for spells and 6-0 for potions). 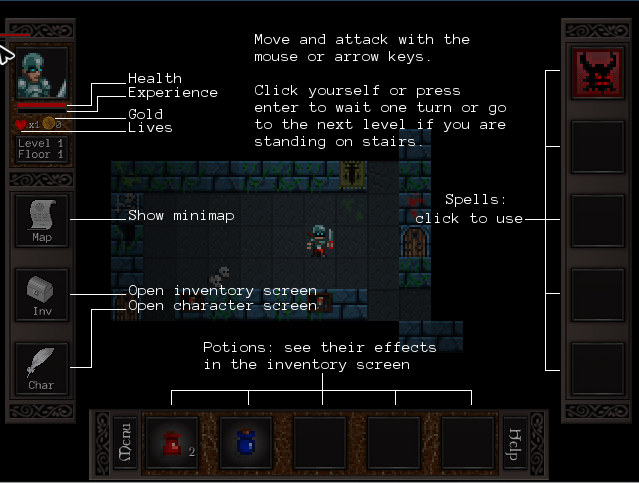 You also use the M (Map), I (Inventory), and C (Character Menu) buttons. Another option is the mouse. You have the option of just clicking on what you need to use or where you need to go instead of having to remember the hotkeys. Even though it doesn’t do much, your inventory screen is pretty helpful. 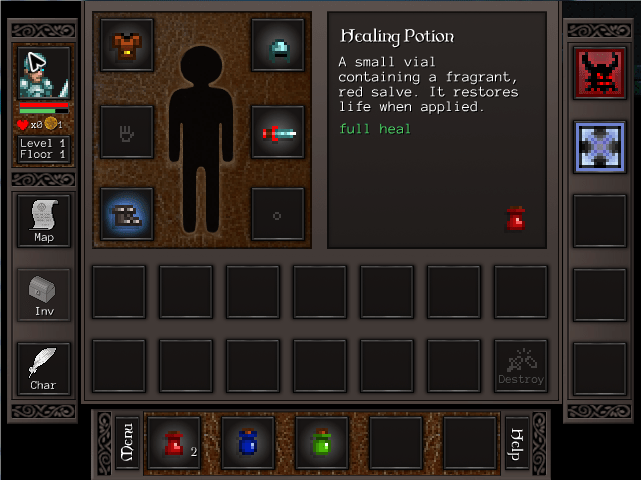 It tells you what all your items, spells and potions do. This is really helpful because some of the names of spells might confuse you; like if you didn’t know what Poly-morphing is, or that Berserk was recharged based on your attack stat. Other than that and holding some spells for later use, it is otherwise useless. Most of the items that you obtain when you run into chests in the game are either auto-equipped if they’re better, sold if they aren’t or stored if they contain a special effect. This makes inventory management easier, but, to me, it also takes the difficulty of the game down a notch. That being said, this game is fairly difficult, but not horrible. You run around the randomly-generated terrain fighting off enemies including spiders, bandits, succubi, etc. trying to get to the staircase at the end of each floor to progress. Some of these enemies have special effects, such as the Succubus being able to teleport around and the Kobold Tricksters casting spells. As you progress, the enemies grow stronger, but so do you. Below your green health bar — located underneath your player — is an experience meter. Once you fill this up, you grow another level and get even stronger. You start the game with two lives, and can only obtain more by finding them in chests. I ought to mention here that this is the only way you can find ANYTHING in the game. There was a shop planned to be a featured in the game, hence the coins, but the feature was scrapped, and not implemented until the second game in the series. Keep in mind that the hearts are very rare drops, so it’s probably best to try and stay safe by not attacking everything all willy-nilly, or you might end up getting yourself permanently killed, and have to start all over from square one. Other than just attacking head-on, you also have spells that you can use. These spells will either increase your stats, do damage or give status effects to an enemy. They can be exchanged with other spells that you have via your inventory, but only five spells can be selected at a time, so be warned. You have no mana pool, either, so the spells recharge depending on how many steps you take, the bigger the spell, the longer the cooldown time. I find the spells very helpful when trying to get rid of multiple enemies because of their range. This means that the spells can hit from a greater distance away. I felt that the graphics in the game matched the gameplay very well. Just like the gameplay, the design has a simplistic 8-bit style look and feel, which is very pleasing to the eye. Other than being fun to play, this game was just cool to look at. It gives the player that nostalgic feeling of playing an older game. The music and sounds in the game were very delightful, as well. As with any classic-style game, you have the classic sound effects. These include the pinging of items when you obtain them, clicking of doors opening, the boom of bashing enemies and the tip-tap of moving. The music in the game also has the classic 8-bit style to it, and is very light-hearted and quick, which is exactly what a game like this needs. Overall, Cardinal Quest is both fun and addictive, but is also a fairly hard game. I love the look, feel and sound of this game, and I am glad to say that it is one of my favorite dungeon crawlers to date. Plus, the nostalgic feeling just hits you right in the face as soon as you start playing it. I found myself playing this game for hours on end, and I loved every minute of it. The only real problems I had were that it was a bit shorter than I expected and there wasn’t much plot to it. It only took me a little over four hours to beat it the first time through, and the only plot was that there was a minotaur and his minions that terrorized a city and you were looking to make them pay as one of the few survivors. But, even despite the game’s flaws, it is still magnificent. I highly recommend anyone to pick up this game who is up for a challenge. The game is just $9.99, and it’s well worth it. I guarantee that you won’t be able to put it down.